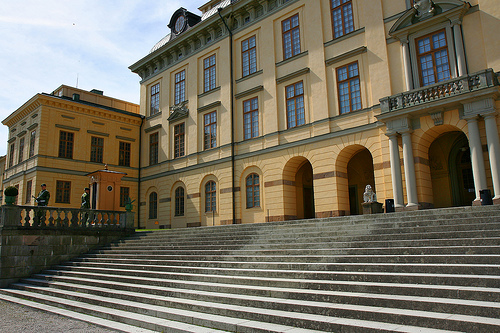 In just a few short miles my carriage would bring us to Drottningholm Palace thus beginning a new journey for me. Although it seemed my carriage was going down every pothole on the stoned road; the unsteadiness of my journey did not deter my happiness at being in a different country. The winter sun shone through my carriage window as we rounded a corner. I nod to my coachmen; raising my eyebrows as I stepped out of my carriage distracted by a servant approaching. "Please tell princess Isabella of my arrival." "My lady" she simply said and smiled at her while standing there in the woman's presence, being a orphan, it was only herself and her siblings there in Sweden other then her aunt Christina Gyllenstierna who come to visit very often as the sister to her own mother. I bowed immediately as the princess stood before me. Looking to Isabella; i gave the girl a gente smile. "I have been sent to keep you company"
I said as i rose from my curtsey. I immediately looked down at my satin shoes ruined by the snow. "Yes; your grace. That would be most suitable"
An expanse of snow lay before me daffodils buds and snowdrops flowers bursting through the snow. I couldn't wait to unravel the Swedish customs this land had. A smile formed her lips at the woman "Then come, we can go inside now. Where would you like to see first?" she asks her while going inside with the woman, the area around them lit with light all around and her skirts drag along the snow which lay upon the ground, Once inside the palace was nice and warm for them.